For creative professionals, distraction is severely unwelcome. Laptop makers have consistently endeavored to deliver distraction-free experiences through a thin-bezel design, meticulous imagery, and non-stop performance. Upping the ante in this realm is the latest HUAWEI MateBook X Pro—a 13.9” laptop that delivers a stunning 91% screen-to-body ratio, a 3K multi-touch display, and a full 100% sRGB color gamut. Alongside, it also boasts of a powerful Intel Core i7 CPU, NVIDIA GeForce MX250 graphics, and up to 14 hours of battery backup for regular computing activities. 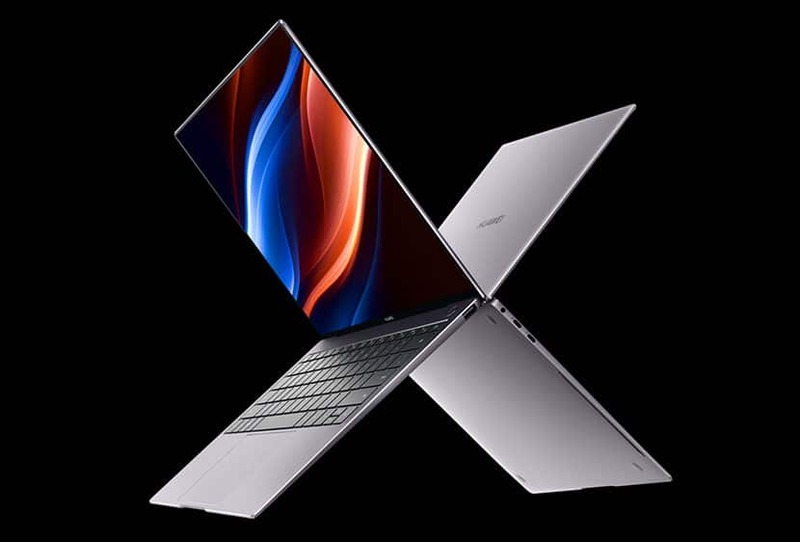 Recently, the HUAWEI MateBook X Pro bagged the “Best of MWC 2019” award by TechRadar, an online technology publication with 47.3 million monthly readers. The award was a shout-out to this device’s remarkable combo package—a captivating display and astonishing performance. Let’s explore the newest MateBook in more detail and assess what it brings to the table. Straight up, here’s everything you can expect from this “borderless” experience: an aspect ratio of 3:2, a viewing angle of 178-degrees, and a contrast ratio of 1500:1. The display offers a brightness of 450 nits that helps make the imagery vivid in various kinds of ambient lighting. When these specs combine with the spacious real estate, you have a screen that renders all types of multimedia content to immense satisfaction. This lets the notebook fit into several shoes: a gaming companion, a design professional’s best buddy, and an entertainment platform. Moreover, since the display is a touchscreen—10-point and anti-fingerprint—you get the option of creating content as you please (read doodles, note-taking, sketching, the works). The newest HUAWEI launch looks prepared to win hearts not only by its charming display but also a processing powerhouse that complements it smartly. The Intel Core i7 CPU is ably supported by 16GB RAM and 1TB of speedy SSD memory. This should be sufficient to run day-to-day computing tasks as well as processor-intensive pursuits like gaming, video streaming or graphics design. It is worth noting the gigantic battery—a 57.4Wh juggernaut—that delivers over 12 hours of backup even if you engage in web browsing. When the laptop is used for video playback, the battery claims to last for 13 hours on a single charge. This is brilliant for anyone who seeks a notebook that travels well and allows the freedom to work away from power stations. One look at this MateBook proves that it values elegance. If the (almost) borderless display conjures ideas of sophistication and captivation, then this notebook’s metallic body with diamond cutting lives up to the mental image. A smooth sandblast finishing lends a luxurious appeal to the chassis. Note that it is available in two colors—space grey and mystic silver. The cherry on the cake, however, is the feather-light weight: only 1.33 kg or 2.9lbs. It is satisfyingly lean too, with a profile that measures just 14.6 mm or 0.57”. It should be perfectly simple to slide it into bags and backpacks to carry to business meetings or classroom lectures. Note: The overall dimensions are a width of 304mm and a height of 217mm. HUAWEI has always valued security, and this offering comes packed with a fingerprint-led sign-in system. Truth be told, the conventional, password-led sign in can be quite an impediment when you need instant yet secure booting. Another handy feature of this notebook is its camera placement—the front cam (1MP) sits on your keyboard, neither obstructing your work nor running the risk of peers/colleagues spying on you. What good would the stellar display be if the acoustics didn’t match up? Thankfully, this MateBook houses a fantastic Dolby Atmos sound system with quad speakers, woofers and tweeters. While the woofers have been designed to have deeper bass, the split-frequency set up helps create a moving sound experience. This should come in useful whether you intend to use the notebook for gaming, multimedia content production, or binge-watching your favorite television series. There’s another territory where the auditory support proves to be superior: digital assistance. This notebook is fitted with quad microphones, enabling it to pick up voice commands from as many as four meters away. So, if your day necessitates some friendly help from Cortana, you will be delighted. HUAWEI has intelligently equipped its most recent launch with the power of easy sharing. 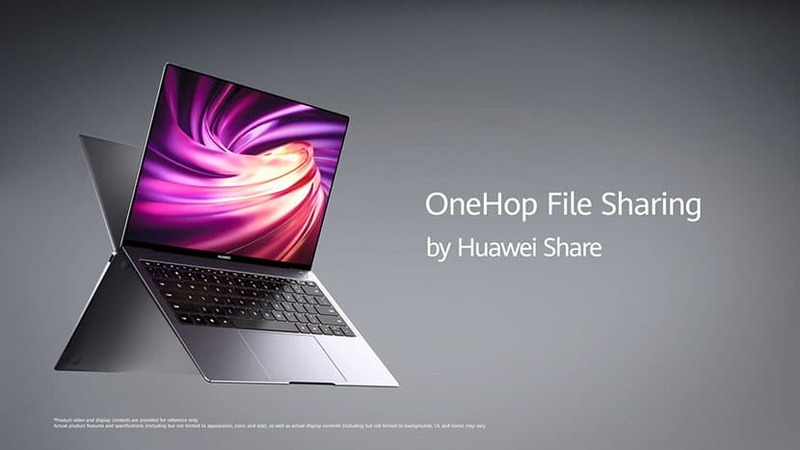 The “OneHop File Sharing” technology allows you to transfer data between your mobile phone and laptop at speeds up to 30MB/s. Additionally, you can also record your notebook’s screen (for 60s) or copy text content—all in one tap. The seamlessness that this bestows upon standard operations needs to be experienced to be believed. Of course, the provision for Thunderbolt 3 is intact, with the multipurpose port letting you transfer data at 40Gb/s and do other vital things like connecting to peripherals and external displays. You can avail of IEEE 802.11a/b/g/n/ac Wi-Fi (2 x 2 MIMO) to hop on to the internet with a fair amount of consistency and speed. The notebook is also compatible with Bluetooth 5.0. At first sight, the HUAWEI MateBook X Pro seems to hold substantial promise. Although it is targeted at an audience that demands top-grade viewing experiences, it pushes the envelope by also delivering a capable performance, convenient portability, and nifty provisions for working in collaborative environments. 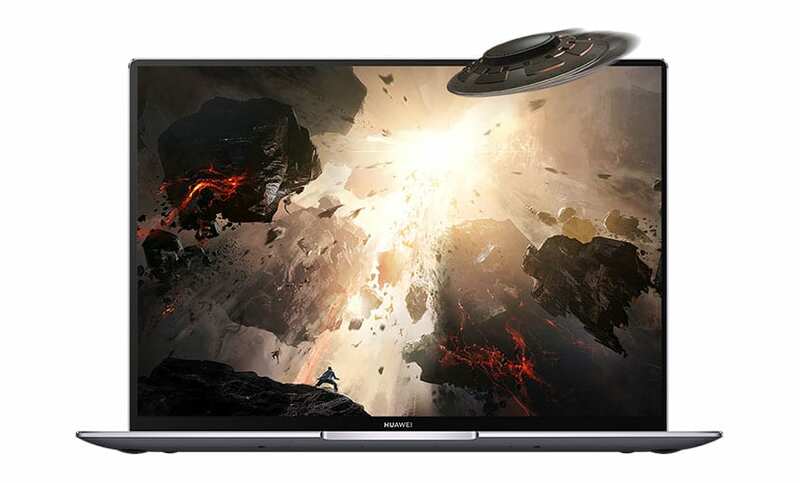 It remains to be seen how HUAWEI prices its latest MateBook. The price point will be a significant determinant of its reception in the increasingly more crowded 13-inch marketplace. 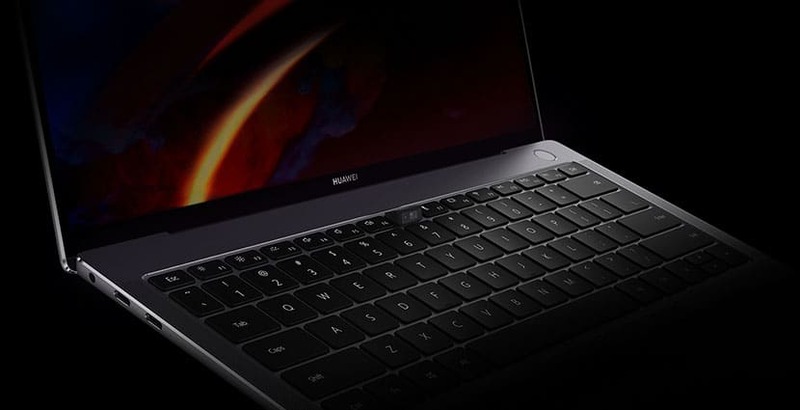 As the year progresses, other leading computer manufacturers are also expected to announce their offerings in the portable computing domain, especially devices in the 13-inch to 15-inch form factors. But this we can safely say: the new MateBook does not believe in stopping for any boundaries—neither in the display nor in its sheer strength—and that is truly laudable.